Feared as a merciless killer, and told of in the oral tales and stories of Nordskaggers people, the Medskala is a slithering predator from the North Skags. While not as deadly as its reputation would suggest, the snake still possesses a venomous bite capable of causing minor adverse effects in Humans and similar species. It also possesses a hinged mouth to ate large prey and a flat tail to help it swim through the rivers it nests in and around. It is a rare predator in the North Skags, and it is unlikely that it will vanish from the world unless there is a concentrated effort to dispel them from their homes. The Medskala has suffered a vague and uncategorized existence for most of its history. The Elven Empire and the Drovv did not explore the territory it could be found in, only setting up logging installations on the fringes of the region that would become the North Skags. But by 30 AC, Ailor were making their way there. Some were Velheim Ailor, born elsewhere in Aloria coming in on their Tall Ships while others were escaped slaves, fleeing up past relaxed Ithania to the frontier of the Elven Empire. During this time, stories emerged of a deadly serpent living in the forests. However, these stories were not viewed as fact and in the devastation of the Cataclysm, ultimately lost as the land around the Ailor cracked, thus forming the three North Skags. For over a century afterward, the animal’s existence remained in stories as the people kept to the coastline or in the more arable land, eeking out a living from fishing and farming what they could. This perception changed in 170 AC. In the Regalian Archipelago, the Skagger Horde was not faring well in their conflicts against the south. Many sought to escape out onto the waters and voyage to Ellador or other areas of the North Belt. It was in that rush that the Skags were discovered and suddenly flooded with newcomers. In this rush, the Medskala fully unveiled itself. A species of serpent that lived by the banks of rivers, its presence hampered attempts to obtain fresh water for several years until they were forced deeper inland and away from settlements. Despite this, the Medskala was already a rare animal, and it survived this cut in their numbers. They have survived until today on the North Skags, with no effective counter to their numbers. The recent warfare in the region between the Hvitskag Horde and Nordskag has put another dent in their numbers but it has yet to rid them entirely from any of the islands. Medskala vary in length, some sitting at modest sizes of six to ten feet but others have been observed to be up to twenty feet long with weights anywhere from 100 to 300 pounds. Their bodies remain at one inch in diameter though some of the larger members of this species can grow to two inches in diameter. Their heads are arrow-shaped with green eyes placed either side of the head and a small frill cresting each cheek. Their mouths are hinged, allowing them to open it wider than might first be assumed and hold two prominent and curved white fangs able to be retracted into the roof of the mouth. Medskala are venomous, though it is has a low level of potency. In smaller doses, Medskala venom does little more than provoke nausea, severe lethargy, and heavy burning sensations in a victim’s chest and their bite wound. In large doses, which a Medskala is unable to give itself alone, the victim is often put into a mild coma and if not that, a day-long sleep. 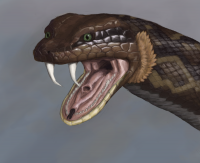 Aside from the fangs, on the bottom half of the mouth, the Medskala has a small black tongue, a glottis (comparable to a nose on any humanoid species as it allows air into the lungs) and a small set of pointed teeth. Their tongues are thick, the fork at the top is small and overall is not as obvious as some other snakes. The rest of their body is like that of a standard snake, with the internal functions to swallow larger dead prey and breath air. The animal does, however, possess a flat tail in its lower-fourth of the body which they use to help propel themselves through the water. Their bodies are covered in scales colored different shades of ochre and brown in a diamond arrangement with random patterning while their undersides are dark grey. The larger specimens possess all of these traits but are also known to develop lighter patches of beige or greenish in order on their backs which allow them to better blend in with their surroundings. Medskalas have an equal amount of males and females in their population at any given time. The larger members of their species, caused by an unknown phenomenon, possessing slightly different physical colors in small patches along their backs. Medskalas are born at the very edge of the water, usually in rotting trees or heavy brush. Their eggs are kept inside of their mother who lays them on the edge of rivers, quickly exposing her offspring to the climate they will be living in for their lives. These batches range anywhere between four to ten hatchlings. Over the next four years, they physically mature to their base sizes of six to ten feet and over a similar period their minds mature as well. Their fangs come in at the age of two. Their mother does not protect them, having already harbored them inside of her. After the age of four, they are capable of sexual reproduction once a year. They can live for up to forty years though rarely made it past thirty. Medskala are known to be intelligent hunters, making up for their weak venom with a dangerous mind. When hunting on land, they lie low and move slowly through when they select prey; they quickly try to surround it with their body or corner it before administering a bite to set their victim to sleep. They then swallow the victim hole and digest it. When in the water, the snake takes a very similar approach though it tends to thrust violently at fish or aquatic life, biting it and then dragging it out of the water to consume. The Medskala rarely attempts to hunt humans, though when it does, it always fails unless the target is an idiot. Its venom alone is not enough to put any Human or Human-like subject to sleep, and most hunters leave with a bite mark, and a trip to the ground as the creature tries to encircle them. The largest Meskala, however, are known to try and squeeze bodies with their size thus suffocating their prey in a death grip. This tactic has rarely been seen as it is limited to the largest specimens. With other members of their species, the Medskala is indifferent, and as many as six Medskalas could slither over one another without an issue though such an event is impossible, to begin with. Medskalas are individualistic, solitary creatures who live alone by the side of rivers on the North Skags. Medskalas claim a territory of two or more miles as their hunting area and only leave it for a brief time during spring and the mating season. In Nordskag, local folklore tells of the Medskala as a harbinger of Alu, the Old Gods deity of death and tragedy. King Olai Schaksson of Nordskag was known for his love of the Medskala, so much so that he allegedly wore a cape sewn from the scales and hide of one. Those who manage to slay a Medskala are known as impressive hunters and this has attracted many notable hunters and hunter species such as the Url to test themselves against the snake. This page was last edited on 24 June 2018, at 09:48.